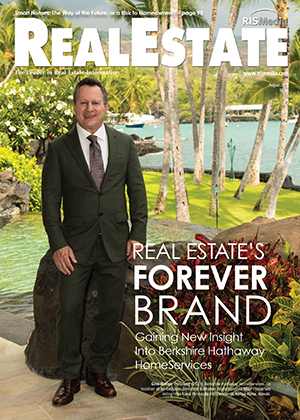 Editor’s Note: This is the cover story in the August issue of RISMedia’s Real Estate magazine. 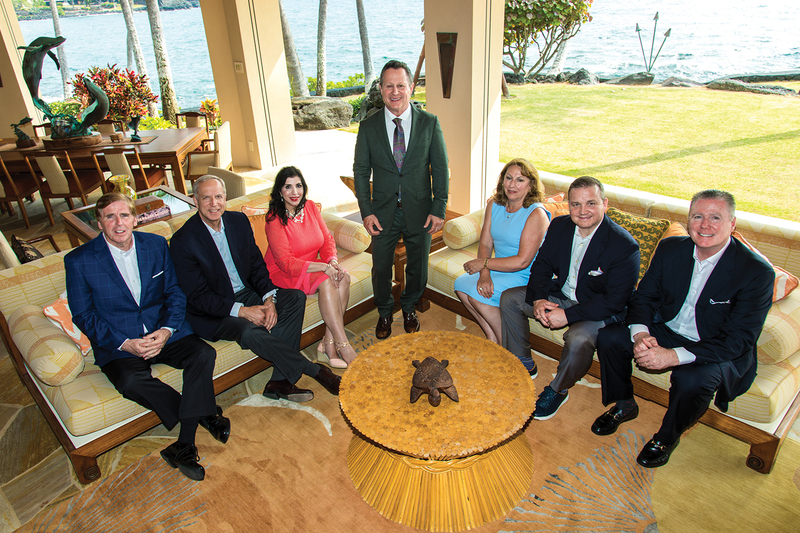 Berkshire Hathaway HomeServices President and CEO Gino Blefari recently hosted the brand’s Top 50 brokerage leaders and their guests at the company’s annual Berkshire Elite Circle conference, an exclusive leadership retreat held in June in Kona, Hawaii. Against a backdrop of sandy beaches and tropical clime, Blefari summarized his immense respect for network members and his vision around Berkshire Hathaway HomeServices’ value proposition. 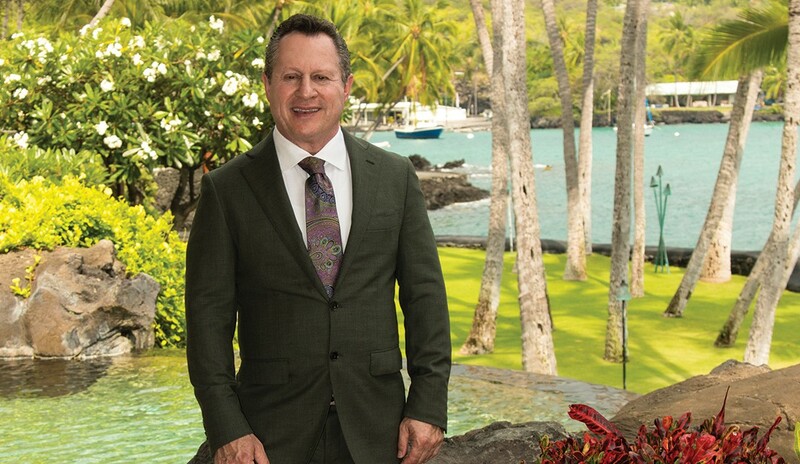 “Forever—as I define it—means enduring through all times, and just as the waves have endlessly crashed against the shores of Kona, Berkshire Hathaway HomeServices will forever serve the lives, lifestyles and needs of our clients,” he said. For Blefari, the concept of “forever” might be simply explained by a maritime metaphor, but its application to the brokerage network and respective franchisees is complex and all-encompassing. Specifically, Blefari believes brands and brokerages must persuade consumers that the company culture represents an extension of this forever concept, focused on nurturing the fundamental role of an agent as a trusted advisor who extends value, skills and advice not only before or after a transaction, but also throughout a client’s entire life. It’s a weighty task to imbue the forever title on a fast-growing network of nearly 46,000 agents working in almost 1,400 offices nationwide (with an expanding global presence), but if anyone is up to the challenge, it’s Blefari and his team. To truly execute a forever vision requires immense insight, inspiration and innovation from all those responsible for turning “forever” into “for real.” At the top of Berkshire Hathaway HomeServices’ command sits Blefari, who understands that great leadership means holding team members accountable for the particular facet of “forever” they have committed to accomplishing. Blefari, with more than 30 years of industry experience, is no stranger to navigating waters both smooth and choppy. His success is the kind many write books about; he began as a golf course manager turned award-winning real estate agent, and later, founded Silicon Valley, Calif.-based Intero Real Estate Services, which became one of the fastest-, organically-growing companies in the history of real estate. At Berkshire Hathaway HomeServices, he’s a hands-on leader, fostering a culture of outstanding performance and accountability by leveraging his operational expertise and experience. Every Thursday evening, tens of thousands receive Blefari’s “Thoughts on Leadership,” a rundown of his weekly travels and the inspiration they bring. A voracious audio book and podcast listener, Blefari has taken his leadership lessons to implement an entire method of operation that every team member at his organization follows. Framed after the best-selling book “The 4 Disciplines of Execution,” team members focus on Wildly Important Goals, or WIGs; act on their lead measures; keep a compelling scoreboard; and create a cadence of accountability. Blefari himself participates on departmental WIG calls, where members announce their WIG progress and set commitments for the upcoming week. It’s a well-oiled machine of process, procedure, time management, accountability and execution at the Berkshire Hathaway HomeServices headquarters—and it has resulted in tremendous growth. Blefari is the first to admit it’s still a work in progress, but tremendous strides have been made, especially in sales. Top-quality brokerages join the network with a regular rhythm, network firms acquire and merge with market leaders to expand their reach, and through careful consultation, Berkshire Hathaway HomeServices network brokerages are increasing profitability at impressive rates. 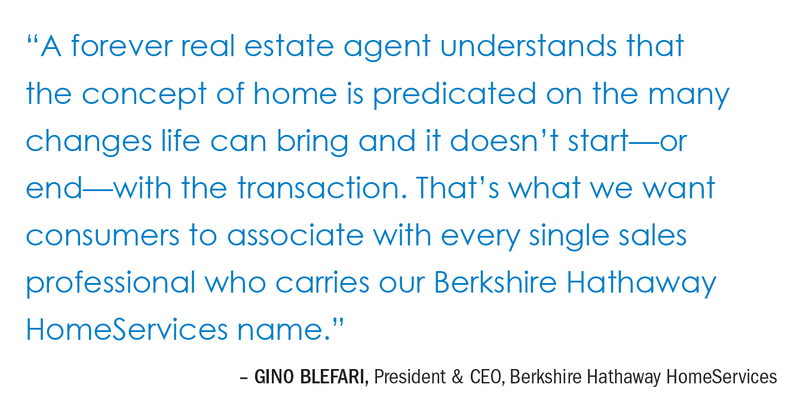 With a sharp focus on growth, Blefari has for two years mentored a group of Berkshire Hathaway HomeServices brokerages called the “Mavericks,” and guided these companies to achieve new levels of success. The original Mavericks group, which is made up of nine Berkshire Hathaway HomeServices network brokerages, (there are plans to expand to a second Mavericks group in 2019), saw an overall 159 percent jump in bottom line, pre-tax profit. Since the group began in December 2015—and up until December 2017—the top five best-performing Mavericks brokerages saw a 4.3 times rise in pre-tax profit, corresponding to 329 percent growth in profit; followed by 4.3 times, corresponding to 328 percent growth in profit; 3.3 times, corresponding to 230 percent growth in profit; 2.6 times, corresponding to 164 percent growth in profit; and 2.5 times, corresponding to 127 percent growth in profit, respectively. Growth at Berkshire Hathaway HomeServices isn’t just a result of more diligently operated network brokerages; it’s also empowered by the tools and systems Berkshire Hathaway HomeServices provides. Leading the technology and marketing charge is Stuart, who understands that forever means being the most innovative and integrative brand in the industry. Stuart helms these initiatives with a strong tech and growth background. Previously, he was part of the executive leadership team at Intero Real Estate Services, and prior to his time at Intero, co-founded a mortgage brokerage firm that grew to become one of the largest in Northern California. He also built and oversaw Silicon Valley-based teams at Oracle, and was responsible for creating some of the very first internet-based applications in arenas ranging from commerce and customer service to knowledge management and inventory control. Today, his extensive technology and business development pedigree is put to work, and Stuart sits in the driver’s seat of the brand’s innovation. Under his watch, Berkshire Hathaway HomeServices is now working with some of the most forward-thinking companies in the world—Salesforce, Adobe and VaynerMedia—to enhance the brokerage network with unmatched technological, digital and predictive sophistication. Concurrently, network brokers, offices, teams and agents will have the ability to create their own experience within the system—vendors and apps can be added or removed in the plug-and-play environment—while still maintaining the Berkshire Hathaway HomeServices brand identity. “Being a forever brand means creating an online experience that’s dynamic and valuable,” says Stuart, who is also at the forefront of a project that will create more transparency and data portability among industry tools and systems. “We’re creating a central data hub that allows Berkshire Hathaway HomeServices, our vendors and our franchisee’s vendors to retrieve data from other platforms and understand the cause-and-effect relationship between them,” he says. It’s a philosophy Stuart staunchly abides by: Every system, tool and program must speak to one another, and be measured, then analyzed, in a data-driven approach to growth. Even brand marketing initiatives with new ad partner VaynerMedia are meticulously examined by an expansive, experienced team to determine what’s working and what’s not, then figure out why. VaynerMedia, founded by social media guru Gary Vaynerchuk, is widely regarded as one of the most cutting-edge marketing firms on the planet. In conjunction with the Berkshire Hathaway HomeServices team, VaynerMedia executives broke down the previous campaign, Good to Know, and transformed it into Good to Ask, a non-traditional, digital-centric marketing machine that uses highly advanced SEO, SEM and targeting strategies to send poignant ads to consumers most likely to connect. The crux of the campaign is high-quality content, delivered as long-form video vignettes, sleek visuals and informational takeaways. Since the campaign launched, the brand has garnered almost 180 million impressions across social media platforms like Instagram, Facebook, YouTube and Pinterest. This innovative tactic to real estate marketing represents only one of many ways the brand is differentiating itself as a forever name. “Forever also means being an all-inclusive leader,” says Teresa Palacios Smith, vice president of Diversity, Inclusion and Multicultural Strategies at HSF Affiliates. Palacios Smith joined HSF Affiliates (which owns and operates the Berkshire Hathaway HomeServices franchise network) in August 2017, tasked with overseeing the franchisor’s commitment to increasing diversity among its brokerage networks. Most recently, Palacios Smith received one of the first-ever RISMedia Real Estate Newsmaker Awards, bestowed to several industry leaders at the National Association of REALTORS® Legislative Meetings & Expo in Washington, D.C., earlier this year. Leaders who received the award exemplify an outstanding ability to garner positive headlines, a direct result of their effectiveness in creating change. “Teresa is transforming the Berkshire Hathaway HomeServices network through her dedication to diversity,” says Jim Park, the national chairman emeritus for the Asian Real Estate Association of America (AREAA). For the Berkshire Hathaway HomeServices brokerage network, “community” is an ever-expanding concept, especially as the brand grows both in America and across the globe. “It’s important for us to develop a deep understanding and respect for the businesses and cultures that distinguish all countries,” says Michael Jalbert, senior vice president of Global Sales for HSF Affiliates. “Forever in the franchise sales arena means being highly selective of the brokerages that join our network and focusing on our global growth,” he says. Since joining the team in October 2017 after previous positions driving growth at major real estate brokerage networks, Jalbert has orchestrated impressive franchise transactions for Berkshire Hathaway HomeServices that are helping to bring the forever brand to new markets. Globally, Berlin became the brand’s first international stronghold in March with the launch of Berkshire Hathaway HomeServices Rubina Real Estate, an award-winning brokerage and recurrent honoree for Germany in the prestigious International Property Awards. In 2017, Rubina Real Estate was named “Best Real Estate Agency” and “Best Property Consultant (Marketing)” for all of Europe. And Berkshire Hathaway HomeServices leaders aren’t just adept at creating forward-moving initiatives; they’re also experts at coordinating all projects to foster the kind of synergy necessary for sustainable progress. The execution of the mission that Berkshire Hathaway HomeServices be real estate’s forever brand also requires excellence in research and development. 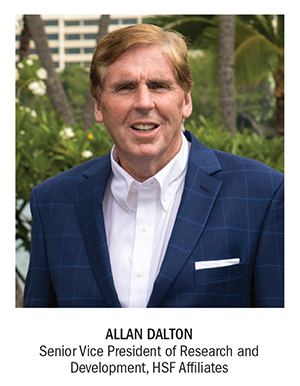 “Selecting Allan Dalton to be senior vice president of Research and Development was essentially an inevitable decision based on his experience, skills, results and scholastic approach to real estate,” says Blefari. Dalton, an author of several real estate industry books, including “Leveraging Your Links,” an examination of the role of social media marketing, brings to his position seminal observations. Dalton believes that as part of the vision of forever, Berkshire Hathaway HomeServices network sales professionals must possess the skills and knowledge to create forever loyalty with their clients. Currently, learning is given significant weight at the brokerage network, and Rosalie Warner, vice president of Network Service, ensures Berkshire Hathaway HomeServices network sales professionals are armed with the knowledge to advise clients worldwide. 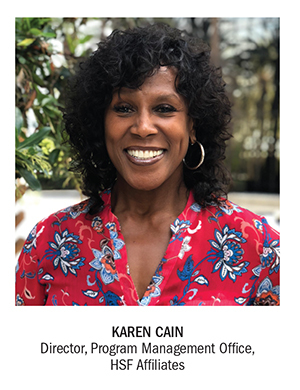 Warner says unlike other brand initiatives that are hurtling toward the digital, her team is out in the field daily, meeting face-to-face with agents and management to provide customized training, solutions and knowledge. “As we see models change, we’re right there changing along with them,” she says. Her team isn’t just changing the game of real estate; they’re also writing the rules on how it’s played. For instance, Warner and leaders from Berkshire Hathaway HomeServices meet several times each year with a group of millennial-age top producers. Named the REthink Council, these network agents share best practices, insights, challenges and wins that are then turned into videos, white papers and content for the network to digest. “The REthink team brings a fresh perspective and makes us ask, ‘Are we doing something the way we’ve always done it because we’ve always done it that way, or because it’s the best way to do it? '” she says. The question ultimately speaks to why Berkshire Hathaway HomeServices can live up to its enduring status. Firmly grounded by the strength of its storied Berkshire Hathaway Inc. heritage, the brand is unafraid of change and constantly anticipating the wave before it crashes ashore. Melissa Kandel is director of Global Communications, PR and Digital Media for Berkshire Hathaway HomeServices. For more information, please visit www.berkshirehathawayhs.com.